Robots are still toys for the young and science fiction for many adults. But they are neither for patrons of the China Construction Bank sub-branch on Jiujiang Road. Robots are still toys for the young and science fiction for many adults. But they are neither for patrons of the China Construction Bank branch on Jiujiang Road. She is a robot who greets customers coming into the bank. At 1.5 meters tall, Xiao Fang has a pleasant female face and a soft voice. She looks somewhat like a human. “Hi! Can I help you?” she asks those entering the bank lobby. Although some people are at first hesitant to talk to a machine, those who do find the experience surprising. Xiao Fang is intelligent, with clear answers on hand on how to open an account, check an account or set codes. She might be called the second-generation of robots. Earlier, the Bank of Communications deployed Jiao Jiao, a smaller and more childish-looking robot, in its outlets. Not just a pretty face. Xiao Fang is designed to resemble a real woman. And besides appearance, she’s smart, too. The biggest difference between the two is that Xiao Fang works independently. She responds to questions drawing on her own artificial intelligence, while Jiao Jiao was controlled by staff behind the scenes. 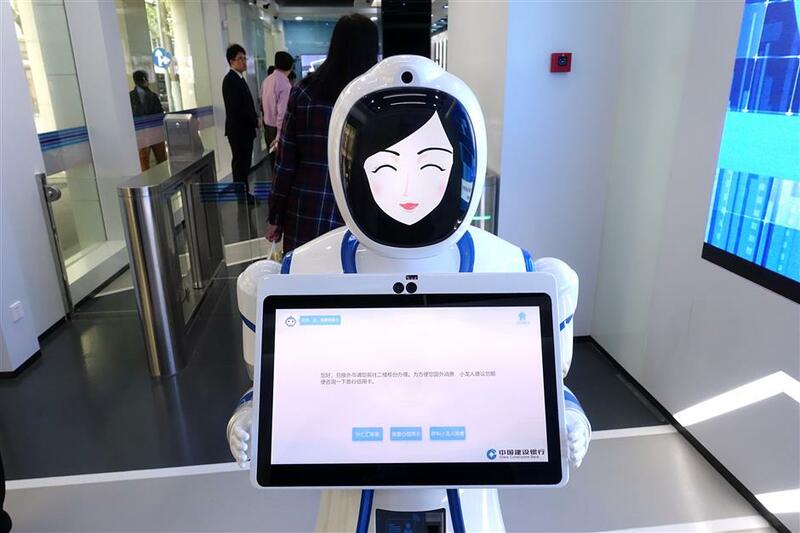 “Xiao Fang does not need assistance in serving as a lobby manager,” said Li Weijia, deputy sales director of Shanghai-based Ferly Digital Technology Co, which makes Xiao Fang and other artificial intelligence devices like fingerprint recognition. “We have made Xiao Fang smart enough to walk and talk like a real person, and to avoid stumbling over obstacles or talking too much,” Li said. But the questions she can answer are limited to those related to banking. If you ask her about the weather or if she has a boyfriend, Xiao Fang just smiles. And if too many people crowd around her asking questions, she tends to look lost. But whatever the shortcomings, her presence in the bank has created something of a sensation. Customers can often been seen taking selfies with her. All good news for Ferly Digital, which manufactured 50 Xiao Fang-type robots last year and has received a hefty order book so far this year. The company, established in 2002, will get another round of financing valued at 50 million yuan (US$7.96 million) after it becomes a supplier to China Construction Bank. The company is attending the current China (Shanghai) International Technology Fair, where it is exhibiting its robots and other technologies. Yes, so wonderful, in fact, that more companies are piling into the sector, presenting fiercer competition to pioneers like Ferly Digital. 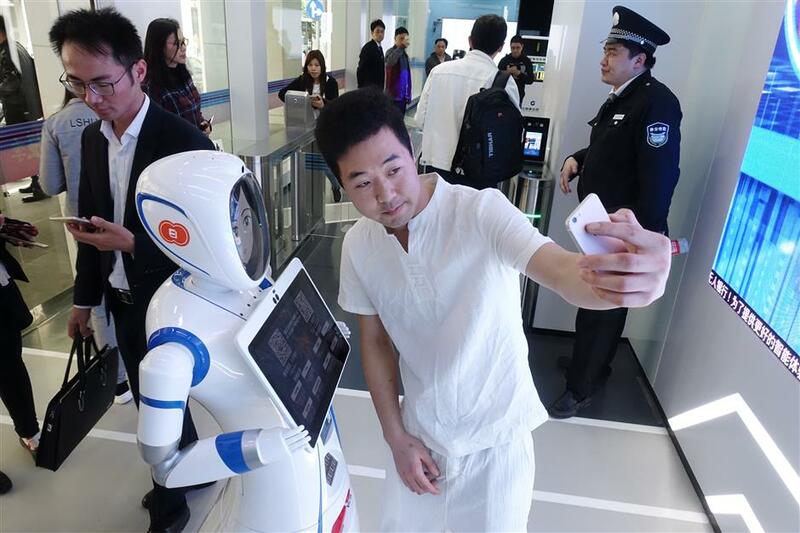 Already there are an estimated 1,500 companies in China wrestling to make robots more and more like human beings.